A fund has been established in partnership with the AFT Disaster Relief Fund to assist AFTNJ members and retirees suffering losses from the storm and its aftermath. The fund is part of the union’s tradition of solidarity with members overtaken by natural or man-made catastrophes. The fund will provide some relief— $250 per member household—to help members meet their immediate essential needs for this disaster. While we know it will not help members pay the lion share of the bills incurred by the catastrophic loss, it serves as a token to show that our union stands together. To learn more or to access the application, go to AFTNJ's website. At our November 14, 2012 general meeting, we passed the hat to raise money for the students and teachers of the Robert L. Craig School in Moonachie, NJ, who lost their school as a result of Hurricane Sandy. The amount donated was matched dollar for dollar by AFT Local 1904 and a total of $400 was raised. The money was used to purchase 40 -$10 gift cards to Staples and Target. The gift cards were sent to the Robert L. Craig School Relief Drive so the teachers and families can purchase much needed supplies. 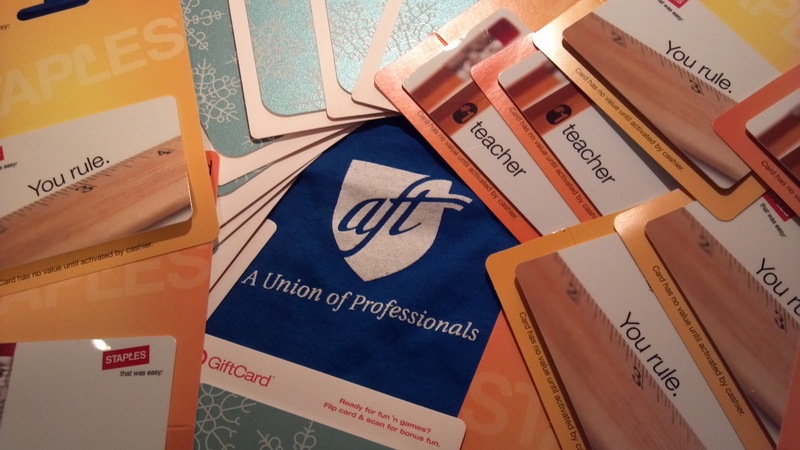 “The members of Montclair State University AFT Local 1904 wanted to help the kids and our colleagues in Moonachie,” said Richard Wolfson, President of AFT Local 1904. “We were fortunate at Montclair State University to suffer only minimal damage as a result of Hurricane Sandy and we wanted to help the families and teachers in Moonachie since they have suffered so much," Wolfson said. Here are some important contact information that may be useful after Hurricane Sandy and the Nor'easter Athena. If any of your students find themselves in a seriously difficult situation that may be impeding their ability to continue their studies to contact Office of the Dean of Students at 973-655-4118 or askdeanofstudents@mail.montclair.edu. Any employee who is experiencing serious difficulties related to the storm should be in contact with his or her supervisor, dean, vice president, or with Associate Vice President Gilbert Rivera in Human Resources. He can be reached at ext. 5317 or via email at riverag@mail.montclair.edu. AFTNJ’s Executive Committee moved money to provide some limited compensation to those who suffered from losses to their homes, cars and property. If you suffered significant losses or want to volunteer to participate in recovery efforts, please complete a short survey. Additional help is also provided through AFT National and other agencies, click here. Call 211 or go online at www.nj211.org for help with non-emergency issues, including basic human needs. support for seniors or persons with disabilities, children, or mental health issues. State law makes excessive price increases illegal during a state of emergency, and for 30 days following the end of the emergency. Call the NJ Division of Consumer Affairs at 862-209-0130 or 973-220-3474. Call 1-800-JERSEY -7 (1-800-537-7397). Backup numbers: 609-775-5236 or 908-303-0471. Volunteers may also send an email to rowena.madden@sos.state.nj.us. This service is managed by the NJ Business Action Center and the Governor's Office of Volunteerism, both divisions within the NJ Department of State. Call 211 or go online at www.nj211.org. In preparation for Tuesday, generators and paper ballots are being brought to polling locations without power. Contact your county Clerk or visit their website for updates on polling location changes. A listing of county Clerk websites can be found here. There are still many towns and precincts without power. In an effort to ensure that all registered New Jerseans will be able to exercise their right to vote, all county Election offices will be open this weekend for early voting from the hours of 8:30am to 4:30pm on Saturday and Sunday. Contact your county Clerk or visit their website for updates on polling location changes. AFT NJ also has a listing of the county Clerk locations at http://aftnj.org/topics/cope/2012/nj-voting-information-vote-this-weekend/.